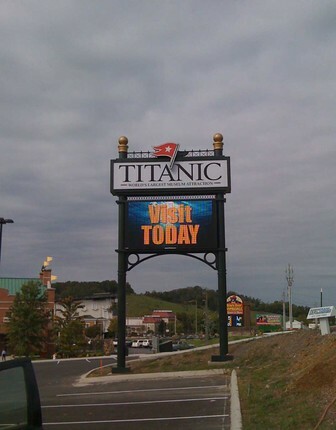 These are a few photos of our trip to the Pigeon Forge Titanic Museum. It was such a nice time. We were blessed to have the company of Professional actor Lowell Lytle aka Capt. EJ Smith at dinner with us. He is a captivating man who has been around the world playing the part ot Titanic's Capt. Smith. It rained just before the opening ceremony which delayed it for about an hour but then, donned with umbrellas, most everyone was eager to just be there. The cast from Titanic: The Musical was on hand to entertain those who remained after the christening of the ship which was performed by Capt. EJ Smith. Friday evening the Liverpool Legends aka Beatles, were superb as they took many of us back in time to the 60's of the Fab 4 & then went on to the 70's when their attire was quite flashy & unique. Hand picked by Louise Harrison (sister) of George Harrison, these musicians are perfect. The evening finished otf with a great display of fireworks. toured the city until evening. Country singer Neal McCoy was the entertainment of the night. After a very nice concert, grand finale' for the weekend was highlighted by another display of fireworks, grander than the previous evening. Sitting there with the Capt. they played My Heart Will Go On, which was the icing on the cake. It really brought emotions to the forefront and we even witnessed a couple of the fireworks that looks like a heart. It was fabulous. The Grand Staircase is breathtaking. If you have the time to go make sure you look for Jaynee to see if she is there. She is a real hoot, what a treasure.